5 Bedroom, 5 Bath, near pool and ocean. This beautiful Gold Rated open home is located on the 13th fairway of the Turtle Point golf course. All bedrooms open onto a deck or porch and all but one are screened. Three bedrooms are master kings , one a queen, and one two twins. A new kitchen with granite counter tops has been added for spring 2015. The community pool is 50 yards from the front door and the ocean is 500 yards. Kiawah Island is located 21 miles from beautiful Charleston, South Carolina, and offers fine and casual dining, miles of bike and walking trails, and a very beautiful, family friendly environment. The home is light and airy and offers the perfect setting for a wonderful vacation. You can golf, hike, bike, and swim or simply relax on the porch swing and read. Judy and I met in college and have been together for over 50 years. Our only problem is that she is a Michigan graduate and I am Ohio State.We discovered Kiawah Island while vacationing at Myrtle Beach and we immediately knew that this is where we wanted our second home. We bought our first house with 4 other couples in 1978 and have gradually moved larger until we have our dream house and location. We love being close to the pool and just a short walk to the ocean. We had previously owned smaller homes on Kiawah and we were looking for a larger place for our growing family of grandchildren. We fell in love with this home because of it's open interior, closeness to the pool and beach, the large front and back porches, and the expanded parking. It is a great home for large families and children. We have several loyal renters who return every year and have become good friends. Parking is very restricted at Kiawah Island and we have parking for a total of 4 cars; 3 in the garage and 1 in the driveway.You can see the pool from the front porch and listen to the ocean from the back porch when the wind is quiet. 21 miles to beautiful downtown Charleston. 0n 14th Fairway of Turtle Point Golf Course. One dining table seats 10 and a second seats 6. Additional 6 seats at table on back screened-in porch. (5) Every bedroom opens on to a deck or porch. Turtle Point Clubhouse with in walking distance. Community pool can be seen from the porch. We truly enjoyed our stay. We had plenty of room and bathrooms for the 8 of us. The kitchen had everything we needed for cooking. The built in ice-maker in the kitchen was well used! We were right by the pool and the teenagers could walk there anytime they wanted. There is not a direct view of the pool (bushes and bathrooms in the way) so younger kids would need a parent with them. There are screened in porches all around the house which we utilized every morning with our coffee and every evening with our adult drinks. The beach was easy to get to by walking or biking. We rented beach equipment and trailers to haul the stuff with and it was at most a 7-10 minute walk. The front porch was our favorite place and a few naps were taken on the front porch swings throughout the week. Overall, I would recommend staying here and would definitely rent again myself when we return. Thank you for the positive five star review and I am delighted that you and your guests enjoyed your stay at " Judy's Joy. " The front porch with the two swings and rocking chairs really is a pretty special place, isn't it! Pleased that you enjoyed it! Our group of five women, which became four, when one had a family emergency, loved the house. We each had our own bedroom and bath. The house is spacious, it was spotless, lots of porches, practically private pool, pretty golf course view. Short walk to beach. We would, and hope to, definitely stay again! Thank you so much for the great review. October is our favorite month there and I am delighted that your group enjoyed the house. 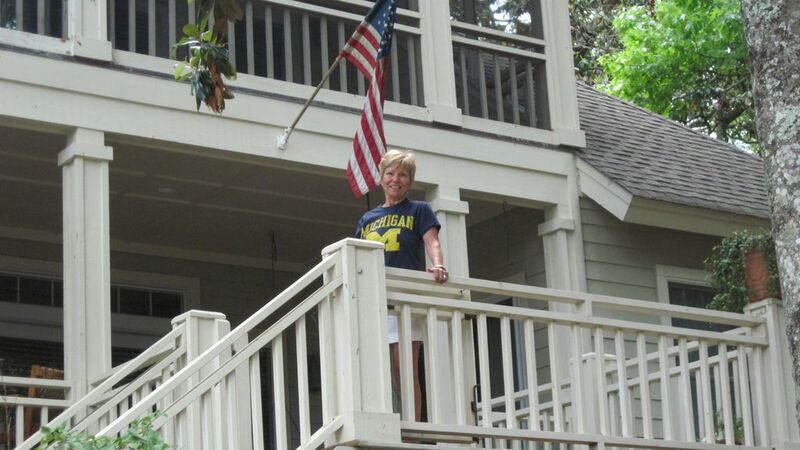 My late wife loved the house and Island and Judy was always delighted when others loved it as much as we do. I have been meaning to write this for a long time. This house is amazing! This was our third time renting this home with friends(4 families). It is spacious and allows for each family to have their own space. It is a short walk to the beach and the community pool is right there and it always feels like it's just ours because hardly anyone else is ever there. Mike is so easy to work with! This house is a must!! Thank you so much for taking the time to share your thoughts. We have named the house " Judy's Joy" in memory of my late wife who we lost in January after 50 years of a wonderful marriage. Judy loved return renters as it spoke to how much they enjoyed the house, just as we have over the years. Thank you for the great review and I will look forward to your next visit! We had a fabulous stay at this house. It was the perfect house for our group of 3 families (adults and teens). If you are thinking of booking, you should know that the house looks even better in person than it does in the photos. The main level is huge, with a brand new, beautiful dining table from Pottery Barn that seats at least 10. It also has a breakfast nook that seats 6. The screened porch overlooking the golf course is also larger than it appears and is lovely, as is the covered front porch on the other side of the house. The beds were all in good shape with quality mattresses which is important to us when renting a house. One of the master bedrooms also had a futon-like double bed in it. The kitchen and bathrooms were very well-stocked. The community pool is steps from the house and feels like a private pool. No one else used it while we were there. The ocean is a nice walk and an easy bike ride from the house. We liked the privacy of the house, with it being just a short distance from the beach, but on a cul de sac and without the foot and bike traffic that the beachfront properties experience. The house was spotless and extremely well-maintained. Everything was in excellent working order. The owners were wonderful to work with. We have rented many beach and lake houses over the years and this is among the best. We would gladly return, and are already making plans to. We were very satisfied with the home itself and the location. We were not happy with housekeeping. We had mold in the showers. All the faucets have mold. A shower curtain had to be changed, Maintenance finally did come out and change the shower curtain, and clean the mold out of the handles in the showers. We neglected to check all the bathrooms so 3 of them did not get done. The bedding was not clean, there were no mattress covers and the comforters, especially in the back upstairs bedroom with the king were extremely dirty. The shower curtains also look like they have never been changed. We did call a representative of the owner and he saw to it that these things were done. Also when we checked in there were wet towels in the dryer and dirty sheets in the washer. I am very, very sorry that the cleanliness home was not up to your expectations. It has been a very busy rental reason with only one open week , but that should not be an excuse. We pay over $300 for each cleaning and have had issues in the past. I'm glad Brian responded and I also thank you for letting both him and me know that it was unacceptable. I will be discussing the situation with him. I would also offer you a partial refund and will send you a check next week. I would recommend this area to anyone who enjoys great surroundings, wonderfully warm and friendly people, a beautiful home located in an incredibly beautiful area,wonderful restaurants and attractions...it has everything a vacation spot could offer.. Organized children's programs (Camp Kiawah) Kiawah Island Marathon.